Have you noticed any areas in your home that always tend to be warmer or cooler than others – despite your best efforts at cranking up your heat or air conditioning? Most of us depend on our central HVAC systems to create a comfortable living environment during cold weather – or more often hot weather, for those of us living in Sarasota and Charlotte County. So, areas of uneven temperature can be a source of frustration. Not to mention the cause of many family fights over the thermostat. The good news: hot or cold spots in your home are not just your imagination –they’re actually quite common. The even better news: these aggravating anomalies can be remedied. First, let’s rule out the simpler issues. Before we get too in-depth, we’re going to discuss five common causes of hot and cold spots with simple solutions. Then, we’ll delve into four other potential problem areas that call for more complex remedies. Your central HVAC system uses ducts to deliver cooled or heated air into your home through vents. The ducts also cycle air from your home back into the HVAC system again through another type of vent called a return. If these vents are blocked, the air in your ducts is not allowed to enter your room, let alone begin to regulate the temperature. In your room that’s having the temperature issues, start by locating your supply and return vents. These vents could be located on the ceiling, floor or walls. Then, make sure that a.) they are open, allowing air to flow through, and b.) nothing is blocking them. It’s possible for a rug or a piece of furniture to be covering them up, blocking the airflow. If you don’t use this room often, you may have closed the supply vent(s) on purpose, thinking that this would save you money on your electricity bill. This seems logical. However, we recommend against closing air vents, as it can eventually cause damage to your HVAC system’s blower motor. A better way to control airflow to an underused area is by installing a zoning system, which we will discuss later in this post. A dirty air filter may account for some airflow issues. If your filter is clogged, your HVAC system has to work harder to force the air to pass through it. As you can imagine, not only does this put strain on the equipment, but also it results in reduced airflow to your home. Less airflow means that it will take longer for the temperature in your home to regulate. Be sure to check your filter and change it if necessary before looking into deeper issues. We generally recommend changing a disposable filter or cleaning a reusable one every 1-3 months. Do certain parts of your home get a lot of direct sunlight? If so, these areas probably feel toasty warm at some times of the day while other rooms remain cooler. Or, you could also simply run a ceiling fan which, although it wouldn’t reduce the temperature, would make the room feel cooler. Otherwise there is the option of adding supplemental cooling, like a ductless mini split air conditioner. Generally speaking, your thermostat should be located in an area of your home that is not exposed to direct sunlight or other heat sources. Your thermostat’s primary mission is to tell your air conditioner or heating system how much cool or warm air to deliver in order to achieve the set temperature. To accomplish this, the thermostat needs an accurate reading of the ambient temperature. This means that direct exposure to heat (or cold, for that matter) would result in an incorrect reading. In some cases, the easiest solution is simply to remove the heat source: cover the window or move the lamp. In other cases, you may need to move the thermostat. Ask your HVAC professional (like us at Kobie Complete) for their recommendation. Like solar heat gain, air leaks can wreak havoc on your HVAC system’s ability to regulate your home’s temperature. Check for gaps and cracks around windows and doors – any potential access point for air to seep in from the outside– and seal off as many of these as possible. Now that you’ve ruled out the rather simple possible causes and solutions, it’s time to dig a little deeper. Let’s talk about four other causes of uneven temperature with more complex remedies. Are you certain that your vents are free from obstruction and your filter is clean, but you’re still experiencing temperature issues? First confirm that air is flowing through the ducts when your HVAC system is running. Just hold your hand in front of the vent. If there is no airflow or less airflow than in other rooms, there could be a number of reasons for this. The first possible cause is leaky or damaged ducts. Ideally, your ducts should be entirely sealed so that no air escapes to where it’s not supposed to go – for instance, into your attic, basement or a crawlspace, where your ducts are typically located. If there are holes or faulty connections, some air may be escaping. This can not only create a drain on your comfort, but also on your wallet. According to Energy Star, “In a typical house… about 20 to 30 percent of the air that moves through the duct system is lost due to leaks, holes, and poorly connected ducts.” That’s a lot of conditioned air – and the energy used to create it – slipping through the cracks. The first thing to do is to inspect your ducts visually. Do you see any areas where the ducts appear loose or sagging? Or, do you see any obvious signs of damage? A thermal camera can help you spot leaks quickly. While you could attempt to seal and repair your ducts yourself, it’s best to call an HVAC professional like us to do a thorough job for you. We can pinpoint problem spots and repair or replace ducts and connections as necessary. We’ll also check to make sure your ducts are properly insulated. There is also the possibility that your ducts were not designed or installed properly to start with. With recent advancements in air conditioning technology, your ducts might not even be the right size to handle the performance demands of new-fangled high-efficiency units. Unfortunately there’s no easy solution here. So you’ll need professional advice when it comes to resolving a duct sizing or installation issue. The remedy with the most long-lasting results may be to replace your ducts. Your air conditioning your heating system needs to be sized properly in order to provide enough heating or cooling to your home. When we say “sized properly”, we mean that it needs to have enough capacity. This is normally reflected in the tonnage. But we’ll leave the technical details for another post. Suffice to say that if your air conditioner, heat pump or furnace is undersized, it will struggle to meet the demands placed on it. This will result in areas of your home never quite reaching the desired temperature. Likewise, if your equipment is oversized, it will cool or heat too quickly, also resulting in uneven temperatures. Additionally, because the unit was not allowed to run long enough, it will not properly regulate the humidity. If your air conditioning equipment is the wrong size, the best thing you can do is replace it with equipment properly sized for your home. 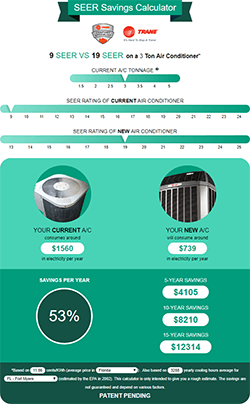 There are several methods for determining what size of air conditioner is right for your home. One method involves estimating tonnage based on square footage, number of windows and number of occupants. The most thorough approach is to perform a load calculation, which is essentially like a room-by-room audit of your home’s air conditioning and heating needs. Consult with your HVAC company for their professional advice. We’ll be glad to provide more information. If you recently built an addition to your home’s living space, this new layout might present an issue. Especially if the impact on your HVAC system wasn’t thoroughly considered. First, your HVAC unit might have been sized properly to heat or cool your home prior to the renovation. But now, the extra space might be stretching its limits and causing uneven temperatures. Solutions for this range from replacing your HVAC system, to extending and modifying your ducts, to adding a ductless mini split system. This all depends on the size of the space, the amount of extra heating and cooling needed, and how much work was already done during the renovation (e.g., whether the existing duct system was extended into the new space at all). Finally, this last cause of hot or cold spots in your home may have nothing to do with your air conditioning equipment at all. Or at least, not directly. You might simply have different comfort needs in different areas of your home. Or, different family members may have different ideas about the ideal temperature in their respective areas. In this case, we recommend a zoning system. A zoning system, like the Trane ComfortLink II (which we at Kobie Complete install), allows you to define areas of your house – called zones – and control the temperature in these zones individually. For instance, you might want to make the living room warmer for watching TV and your bedroom cooler for sleeping. Remember when we recommended keeping all vents in your home open – even in rooms you rarely use? A zoning system would allow you to direct less airflow to these less-used spaces. This can save you on your energy bills. If you’d like more information on a zoning system, contact us today. For more help in fixing hot and cold spot issues, give us a call at (941) 474-3691. We hope you now have a clearer idea as to what could be causing the temperature imbalances in your home. Do you need help with diagnosing a duct problem? Or determining what size of air conditioner, heat pump or furnace is right for you? Or maybe you’d like more information on a mini split system, or a zoning system. Whatever the case may be, give us a call at (941) 474-3691. We’ll be glad to help you.